I read. I write. I dabble. I drabble. I host challenges. I run contests. I like fun, and fandom is my playground. AU. She was the most sought-after demoness at court, but no suitor could conquer her. He was only trying to feed his family when his stray arrow felled a mythical beast. A kind-hearted man. A fierce lady. A romance told in bits and pieces during Dokuga Drabble/Drawble Nights. Genderbent SK. CU. More than Sesshoumaru’s pride took a blow when he lost his arm. He’s in a delicate position... and desperate enough to seek the advice of a self-proclaimed expert. A clumsy romantic adventure told in 100-word snippets. Second Place 'Best Portrayal of Sesshoumaru' for 1st Quarter 2011 at Dokuga. CU. In this canon divergence, the last shard of the Shikon no Tama turns up in a *much* more interesting place, and only one person has the heart to retrieve it. A small story in small chapters. First Place 'Best Portrayal of Kagome' for 1st Quarter 2011 at Dokuga. CU. Something goes awry during a trip through the Well, and Kagome is stranded in the distant past, where she encounters a familiar face. When a very young Sesshoumaru decides to keep her, the consequences ripple through time. A story told through a series of drabbles and oneshots. This is headed towards romance, but it's taking the scenic route. First Place 'Best Portrayal of Kagome' for 3rd Quarter 2009 at Dokuga. First Place 'Best Canon' and Second Place 'Best Portrayal of Sesshoumaru' for 4th Quarter 2009 at Dokuga. First Place for both 'Best Portrayal of Sesshoumaru' and 'Best Action/Adventure' for 1st Quarter 2010 at Dokuga. First Place for 'Best Drabble' for Hoppy, Croppy, Poppy, 2nd Quarter 2010 at Dokuga. First Place 'Best Portrayal of Kagome' for 3rd Quarter 2010 at Dokuga. First Place 'Best Portrayal of Sesshoumaru' and 'Best Canon' for 1st Quarter 2011. CU. A story, though a bit of an unconventional one. Told through a series of drabbles and oneshots, Imperceptible traces the progress of trust between Sesshoumaru & Kagome. Second Place 'Best Canon' and Second Place 'Best Portrayal of Sesshoumaru' for 2nd Quarter 2008 at Dokuga. Third Place 'Best Canon' for 3rd Quarter 2008 at Dokuga. First Place 'Best Drabble/Drabble Collection' , Second Place 'Best Portrayal of Kagome', and Third Place 'Best Portrayal of Sesshoumaru' for 4th Quarter 2008 at Dokuga. First Place 'Best Portrayal of Sesshoumaru' and Second Place, 'Best Oneshot' for Observations for 1st Quarter 2009 at Dokuga. Second Place 'Best Canon' for 2nd Quarter 2009 at Dokuga. First Place 'Best Canon' and Second Place 'Best Portrayal of Kagome' for 2nd Quarter (2.0) 2009 at Dokuga. Second Place for 'Best Drama for 2nd Quarter 2010. AU. Kagome is stunned to learn that she's inherited a sizable fortune, a Japanese estate, and an indentured youkai. She's an unlikely heiress, and Sesshoumaru is the perfect butler. This is a fun little romance that is carried out through a series of 'perfect' drabbles, so most chapters are just 100 words long. Crazy? Probably. ::cheerful shrug:: Chapters follow prompts from the Live Journal community 100colors; if you want to see them, they're on my LJ. First Place 'Best Drabble/Drabble Collection' for 2nd Quarter (2.0) 2009 at Dokuga. Second Place 'Best Romance' for 3rd Quarter 2009 at Dokuga. AU. Mrs. Higurashi decides to help her daughter put her life together; enter Sesshoumaru, professional organizer extraordinaire. Kagome resents having a perfect stranger rummaging through her messes, but he's bound and determined to show her the folly of her easy-going ways. A romantic comedy told in 100-word snippets. "You're a Mess" - Second Place 'Best Drabble' for 4th Quarter 2009 at Dokuga. "Greater Appreciation" - First Place 'Best Drabble' for 1st Quarter 2010. First Place 'Best Humor/Parody' and Third Place 'Best Portrayal of Sesshoumaru' for 2nd Quarter 2010. "Cross Purposes" - First Place 'Best Drabble' and First Place 'Best AU/AR' for 3rd Quarter 2010 at Dokuga. "Timeshare" - First Place 'Best Drabble' and First Place 'Best Portrayal of Kagome' for 4th Quarter 2010 at Dokuga. "Historical Significance" - First Place 'Best Drabble' for 1st Quarter 2011 at Dokuga. The Dark and Stormy Knight - A knight, a damsel, and the source of her distress. AU and OOC. Humor/Parody. Pale Shadows - It's Halloween, and Kagome keeps catching glimpses of something... or someone... out of the corner of her eye. An imposing presence, an implicit threat, and a message from beyond. CU, Modern Era, Divergence. Written for D.S Anno's and Rikayu-chan's Halloween Challenge. Perceptible is a collection of random drabbles written for various contest communities or challenges. - Aloft - Sesshoumaru takes Kagome into the skies. Very WAFF. - Wolf Whistles - She always went out of her way to pass that particular construction site. CU, Modern Era. First Place 'Best Drabble' winner for 2nd Quarter 2008 at Dokuga. - An Indecent Number - Kagome is in labor, and nobody will listen to what she's been trying to say. Humorous. CU, Modern Era. - Minstrel - She'd been so sad since the well closed, but Souta suspected he'd found just the thing to cheer her up. A beginning of sorts. CU, Modern Era. - How Do You Do? - A song!fic courtesy of Mother Goose. Kagome realizes that she recognizes Sesshoumaru. - In Padua - a miniature comedy of Shakespearean proportions. Sesshoumaru uses his wits and well-placed words to woo the waspish Kagome. - Nosebleed - the rise and fall of the Killing Perfection. Plenty of doubling, not enough entendre. FanArt - I've decided to keep links to story art all in one place, so if you're interested in seeing illustrations for these and other stories I've written, this is The Master List, organized by tale. 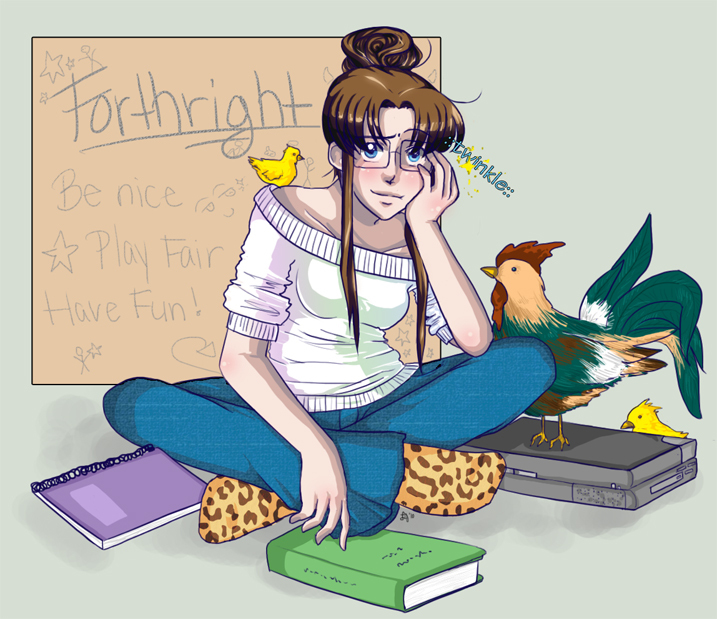 You can also visit, watch, join, or add to the galleries at the Forthright-FanClub and Unpoiled-FanClub over on deviantART. A story told through a series of drabbles and oneshots, tracing the slow and steady progress of trust. NEWEST: 'Plummet' An unwise wish would mean disaster. A mismatched collection of unrelated drabbles that are unquestionably S/K. Universe varies. Newest: 'Nosebleed' A slight expansion of my entry for dokuga_contest's Weekly Perfection Milestone Celebration, Perfect theme. A knight, a damsel, and the source of her distress. This is what happened on that fateful Tuesday. A comic misadventure that breaks a few rules. AU. Humor/Parody. Oneshot. CU. Something goes awry during a trip through the Well, and Kagome is stranded in the distant past, where she encounters a familiar face. When a very young Sesshoumaru decides to keep her, the consequences ripple through time. A serial tale told in bits and pieces. Romance takes the scenic route. COMPLETE. AU. Kagome is stunned to learn that she's inherited a sizable fortune, a Japanese estate, and an indentured youkai. She's an unlikely heiress, and Sesshoumaru is the perfect butler. Complete in 100 chapters. It’s Halloween, and Kagome keeps catching glimpses of something... or someone... out of the corner of her eye. An imposing presence, an implicit threat, and a message from beyond. Canon Universe, Modern Era, Divergence. A oneshot written for D.S Anno's and Rikayu-chan's Dokuga Halloween Challenge. AU. Mrs. Higurashi decides to help her daughter put her life together; enter Sesshoumaru, professional organizer extraordinaire. Kagome resents having a perfect stranger rummaging through her messes, but he’s bound and determined to show her the folly of her easy-going ways. A romantic comedy told in 100-word snippets. COMPLETE. AU. Everyone knows that a hanyou comes from the union of a human and a youkai. In this case, the union of a human and a youkai is brought about by a hanyou. Sesshoumaru x Kagome. Valentine\'s Day Oneshot. In this canon revision, the last shard turns up in a *much* more interesting place... and only one person has the heart to retrieve it. A small story in small chapters. CU. More than Sesshoumaru’s pride took a blow when he lost his arm. He’s in a delicate position... and desperate enough to seek the advice of a self-proclaimed expert. An awkward romantic adventure told in 100-word snippets. AU. A oneshot that revisits the Clutter universe. Professional organizer Sesshoumaru Saiga goes to great lengths to right a terrible wrong... sorta. Written for dokuga_contest's oneshot contest, Indignity theme. In the aftermath of the Final Battle, the victors lick their wounds and look ahead. However, a misspent wish on the Shikon-no-Tama changes minds, hearts, fates... and colors. Canon Divergence. Hurt/Comfort. Imperceptible was my first Forthright. I've been hooked ever since and am continually impressed by your twinkling prose. Thank you for all of your marvelous work! I have loved your stories since I read unspoiled so long ago. And I have loved every story after that. You are amazing and I look forward to reading the finished versions of the others. Thank you so much for right such amazing awesomenessness,. When I grow up and publish my stories I hope my writing captivates my readers and brings them into a world where the words make the scene just as your books do for me. I love your writing,. Have someone ever told you that... You will give a heart attack with your cliffhangers??!!!! LOVE THEM!! It's fun doing sketches for "Lord Charming". *scribble scribble* Upside down awareness! Feedback from forthright: YES! I am fond of upside downness, fair scribbler! (Fortherecord, totally not stalking around your profile at 2am).